We all know that RE/MAX Realty Group agents are among the most highly rated in Rochester! More than 1,850 consumers have recognized RRG agents with 5 Star Reviews! We're having a friendly competition on our way to reaching 2,000! It’s the best time of year to be reaching out to past clients thanking them for their support. Asking for reviews can be an easy extension of that conversation! The more new 5 Star Reviews you get the greater your chances to win great prizes! Our contest will run until we reach 2,000 5 STAR Reviews (currently 1,850) or Dec. 15th, whichever happens first. ​3rd Place: $50 marketing department credit. All new 5 STAR reviews received after Oct 31st. 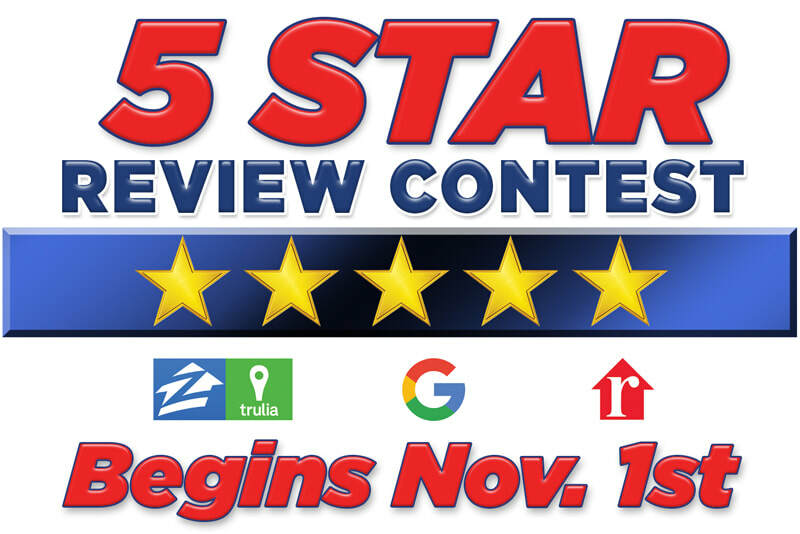 to Dec. 15th or until we reach 2,000 (whichever happens first) from Zillow/Trulia, Google, and Realtor.comwill be tracked and tallied for the duration of the contest. The top 3 agents will be awarded prizes. New Facebook recommendations will not be counted in this contest. We are here to help!! Your marketing representatives (Clyde, Tina, and Katie) along with Julia will be assisting you with any marketing needs you require including personalized postcards or notecards with review instructions, pre-made emails with your personalized voting links, or help with soliciting your own reviews from your Zillow, Google, and realtor.com accounts. Client reviews are a real estate agent’s bread and butter, but for different reasons, many agents forget or are hesitant to ask for them. By letting clients know that reviews help other consumers make more informed buying and selling choices while improving your customer service, you can feel more comfortable asking for their feedback. These scripts—used in person or through email—can help you get the conversation started. Click the link below to download the Script Starter PDF. Watch the quick tutorial below to learn how to solicit reviews directly from your Zillow account or tap the button below to visit the Zillow Help desk about reviews. Tap the button below for great information on managing your Realtor.com profile including requesting reviews. Every month, millions of consumers visit realtor.com® to help them find homes, and agents to help them buy or sell. Your agent profile can be viewed by consumers on realtor.com® and easily search using the Find a REALTOR® search on the site. Make sure it’s up-to-date and shows you in the best light possible! The video and button below is a good resource for soliciting reviews on Google... arguably the most important place on the web to have positive reviews!